The River Dee is a lovely, classic salmon fly fishing river. Fish Dee the home of greased line salmon fishing, developed at Cairnton by Arthur Wood. 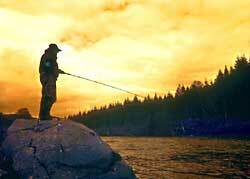 From Mar Lodge to Aberdeen the course of the River Dee is a succession of great salmon fishing beats. Catches of spring salmon are improving and the demand for fishing the Dee is rising but it is still possible to get good fishing, if you know Ally! Spring salmon arrive early on the River Dee and by opening day (February 1) they will be spread through the lower reaches at least as far as Banchory, even if the winter is cold. With recent mild winters good fishing has been available much further upstream as far as Aboyne during March. By the end of April good numbers of springers will be into the upper reaches. May and June are the prime months on the upper beats of the river. Sea trout start to arrive in April and by May the numbers will be increasing towards the peak of the runs in June. The Dee is a clear water river by Scottish standards, especially in its upper reaches where it emanates from the wells of Dee and flows over hard worn granite bedrock before cascading over the precipitious Lin of Dee upstream of Braemar. From there passes Balmoral, Ballater, Dinnet, Aboyne, Kincardine O'Neil and Banchory before entering the North Sea at Aberdeen. 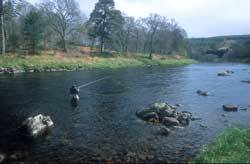 There are too many fine beats to mention them all but Cairnton is a special place, immortalised by Jock Scott's fine book "Greased Line Fishing for Salmon" that describes the tactics of A H E Wood. The development of modern floating line methods and the low water style of salmon fly. The Dee itself is the mother of the Dee Split wing style of fly of which there are many examples and of course the classic low water flies Blue Charm, Silver Blue, March Brown, Jeannie and Logie have found uses worldwide. Usual tackle for the Dee in springtime is a 15 ft and an intermediate or sink tip line, in high water a Wetcel 2 would be useful. Tube flies such as Willie Gunn, Black and Yellow and Black and Orange in sizes 1 inch to 2 inches are big enough. Later when the water drops and warms a floating line is normal and smaller flies such as Stoats Tail, Munroe and the Ally's Shrimps come into their own. A smaller rod is often sufficient in low water or on the higher beats. See Ally's selection of flies and feel free to ask for recommendations for any beat or time of year. As can be seen from the pictures the Dee is a rocky river and wading can be very difficult in places. It is adviseable to take a wading staff and wear a lifejacket. The scenary is often magnificant and the character of the river is as nice as you will find anywhere, hardly surprising that this is one of worlds greatest salmon rivers. The season closes on September 30.